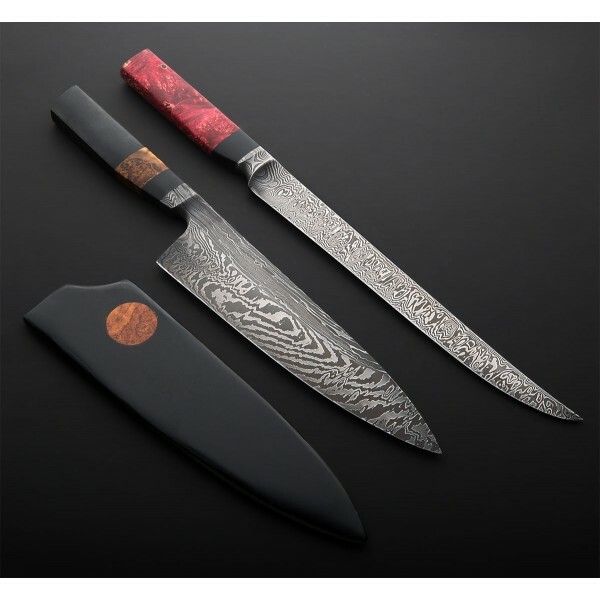 Forged from a housemade four-steel damascus consisting of 1080, 15n20, 52100 ball bearing, and 4800cn carbon steels, Nick Anger creates an especially thin, classically designed 215mm / 8.5" chef knife for everyday prep work. 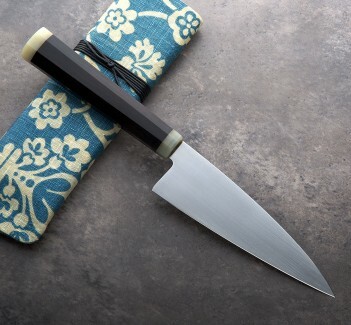 Nick's ability to heat treat and temper his blades with incredible precision results in a hard, thin blade that tapers from a 2mm wide spine at the heel, to 1.3mm wide four inches from the tip, to just 0.3mm wide one inch from the tip. 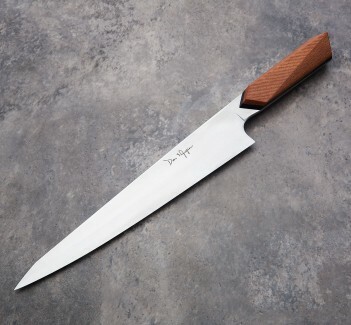 The last inch of the blade is quite flexible, making this a perfect knife for precise and delicate slicing jobs right up to the tip, and light-to-medium chopping, dicing and julienning tasks further down the blade. 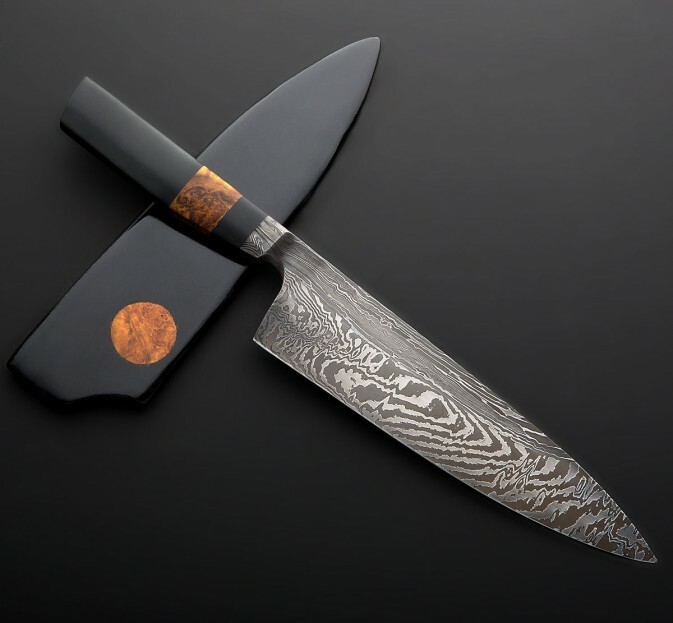 The handle is carved from black paper micarta with a stabilized yellow boxelder burl inlay, and a matching saya handmade by Jared Jasinski is included. This full size integral damascus chef knife by Nick Anger with matching handmade wooden saya by Jared Jasinski is a wonderful representation of Nick's ability to create stunning one-of-a-kind tools that are metallurgic and engineering feats as much as they are works of art. 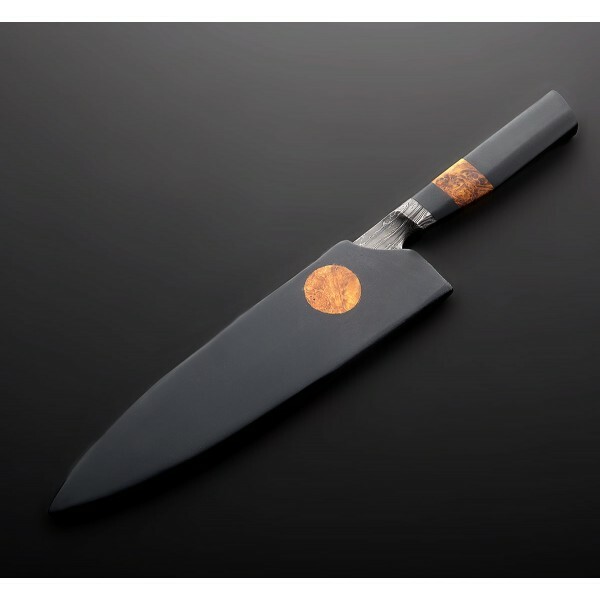 Thin, perfectly balanced at the front of the handle and hardened with uncompromising precision, this stunning custom kitchen knife will enjoy many years of food prep, while being a conversation piece along the way. 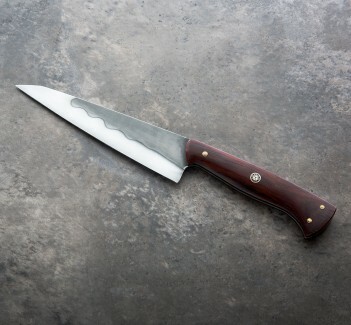 Blade length: 215mm / 8.5".  Overall length: 14". Blade spine width 1" in front of heel: 2mm. Blade spine width 4" from tip: 1.3mm. Blade spine width 1" from tip: 0.4mm. Blade height at heel: 53mm. Weight: 6.3oz / 180g. 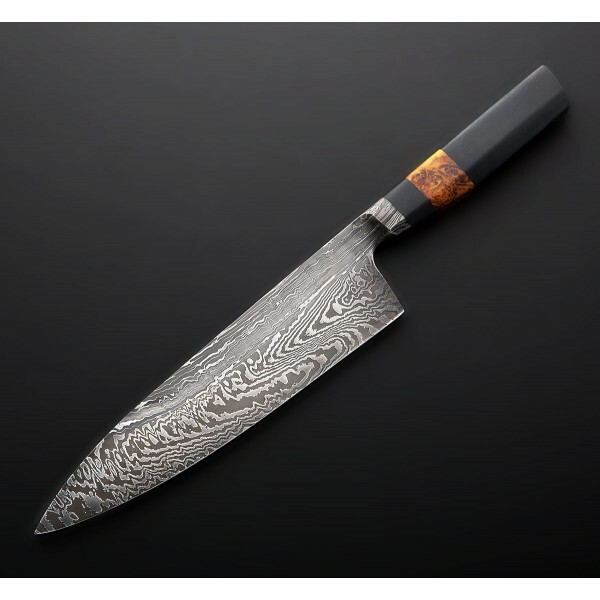 Blade: housemade damascus containing 1080 / 15n20 / 532100 ball bearings, 4800kc carbon steels. Handle: Black paper micarta, stabilized yellow boxelder burl spacer.